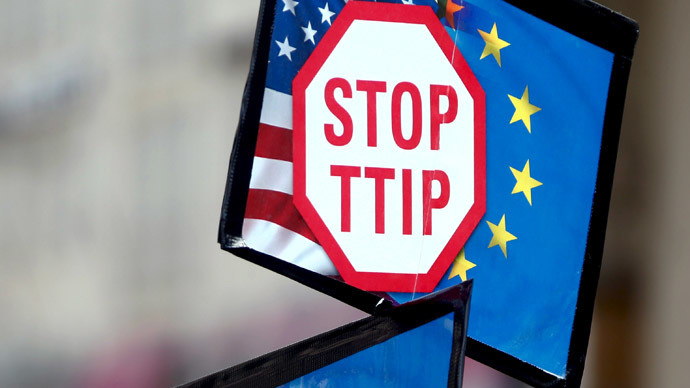 Transatlantic Trade and Investment Partnership (TTIP) talks between Europe and the US should be halted over fears the system of courts used by corporations would bypass human rights, a senior UN official has said. Alfred de Zayas, a human rights campaigner for the UN, told the Guardian he believes a moratorium on the talks was necessary to prevent multinational corporations from abusing their position and exploiting governments. He added that large transnational companies had previously succeeded in blocking government decisions using the support of secret tribunals which are not part of domestic courts. “We don’t want a dystopian future in which corporations and not democratically elected governments call the shots. We don’t want an international order akin to post-democracy or post-law,” De Zayas said. The campaigner will be making a report about the tactics of large corporations which he hopes will highlight the flaws of the potential trade agreement, which is set to create the largest trade bloc in the world. The trade talks have previously come under scrutiny from activists and campaigners, who say there needs to be more transparency in the discussions. European Trade Commissioner Cecilia Malmström responded to the criticism by publishing discussion documents which had been submitted to the talks, and put forward proposals to “safeguard the rights of governments to regulate” trade competition. De Zayas told the newspaper that although Malmström had put forward helpful suggestions, more needed to be done to stop corporations from operating within their own, separate, legal system. “The bottom line is that these agreements must be revised, modified or terminated,” he said. “Article 103 of the UN charter on human rights says that if there is a conflict between the provisions of the charter and any other treaty, it is the charter that prevails,” he added. An EU survey found more than 97 percent of respondents would vote against the deal. De Zayas has previously demanded that healthcare professionals, environmental experts and trade unions be invited to join the talks, but he admitted the UN has not had a huge impact on the current plans. He added that corporate power was already having an impact in courts across the world, with companies suing governments and often emerging on top. “There have been more than 600 such cases and most of them have been decided in favor of the corporations,” he said.